Solar Address Light - - a simple and effective way to identify your home address day and night. 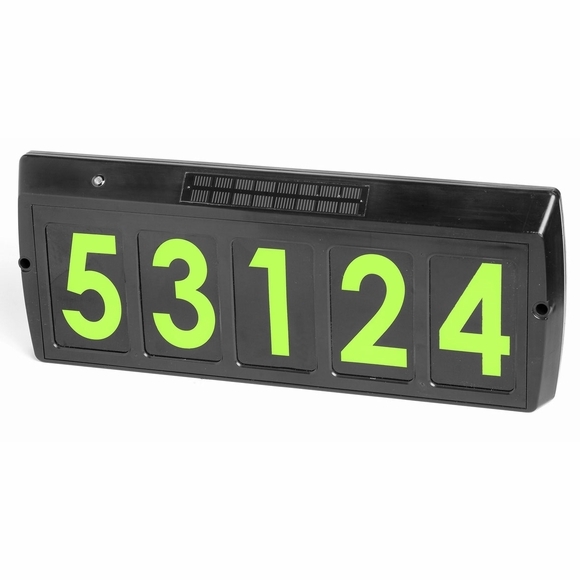 Customizable for addresses with up to five numeric digits. Five super-bright green LEDs illuminated your house number. Light duration up to 12 hours on a single-day solar charge. No wiring needed. Use free rechargeable off-the-grid solar power instead of paying for electricity. Stake in the ground or mount on wall or gate. Dimensions: 14.75"W x 5.75"H x 2.5"H.
Long-lasting solar panel and rechargeable batteries included. Box includes stake, base, 27 digits, and blank cards. Solar-charged address light makes your home address visible day or night with bright green illumination.